Frozen yogurt is a nice treat, especially here in central Florida where it’s HOT and humid this time of year. It’s so easy to make, I don’t know why I haven’t done it before! 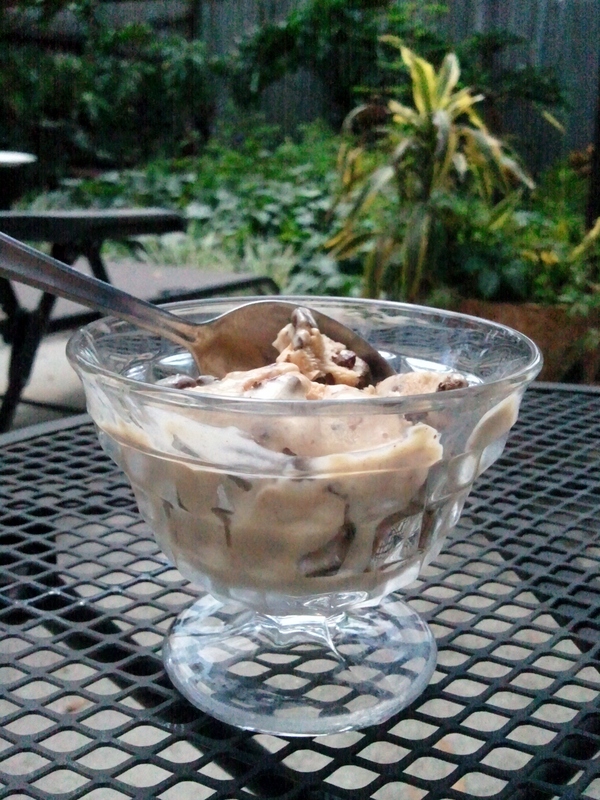 I just used what I had on hand: organic Greek yogurt, banana, peanut butter, honey and dark chocolate. The Greek yogurt and peanut butter adds a nice protein punch to this typically protein-lacking dessert. I don’t usually push the organic, but if you eat yogurt weekly, I highly recommend you buy the organic version to avoid ingesting the hormones and antibiotics present in the non-organic versions. The same goes with meats, eggs, milk and cheese. Add the first 5 ingredients into a blender and blend away until completely mixed. You may need to add a splash of milk to loosen things up and get it going. Lastly, add the chocolate chips and pulse the blender a few times to spread them around. Pour into a freezable container and place into freezer; it takes about 4-6 hours to freeze. What are some your fro yo flavor ideas?